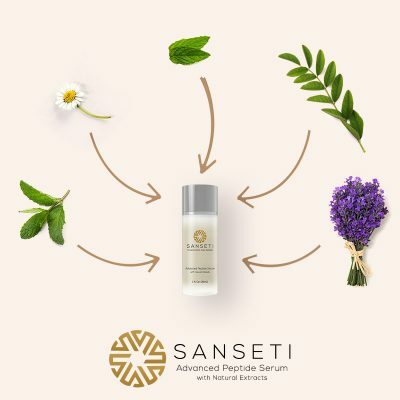 Sanseti’s 2-Step Wrinkle Defense System includes: Advanced Peptide Serum with Natural Extracts and Essential Anti-Puff Eye Gel with CoQ10 & Peptides. Getting older isn’t an easy reality for most of us to face and there are a lot of remedies that people are using in order to hold on to their youthful looks for as long as possible. Proper diet and exercise are two of the areas that many people choose to focus on to begin with, but skin care is a seriously important part of retaining our youth. No matter how you feel, your skin can be a serious giveaway to how old you really are, and it is usually due to those pesky wrinkles. People may say that your wrinkles “tell a story,” but the lack thereof will say a lot more. 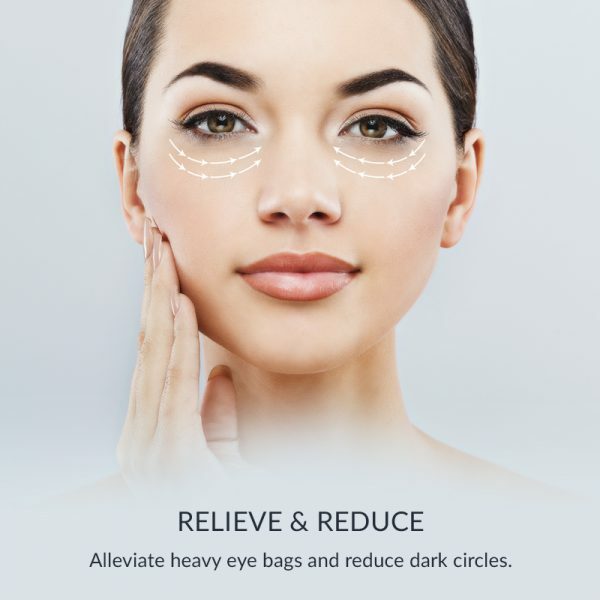 Our simple 2-Step Wrinkle Defense System is going to help you fight those wrinkles with a routine that is packed with high-quality ingredients, easy enough to use on a daily basis, and quite simply – affordable. There are many wrinkle creams and serums on the market that will cost you exorbitant prices – and what good is that to everyone else? Sanseti’s 2-Step Wrinkle Defense System can give you results you want without harming your wallet. This is the best wrinkle product that I have ever tried! I love this product, and I have no plans to try anything else. The 2 step system works! I absolutely love this 2 step system. A friend gave it to me but I was so impressed with this kit that I bought some more to make sure I have a good supply on hand. I hate wrinkles and I’ve been searching for something that works. I finally found it in this 2 step system. My eyes had it the worst, but this product has literally taken years off of my face. I have used so many brands of wrinkle serums but this kit has a difference. First off, it is so subtle on your skin that you barely realize you have applied it. Second, it works. Only two weeks of using it and I’m now enjoying impressive results. 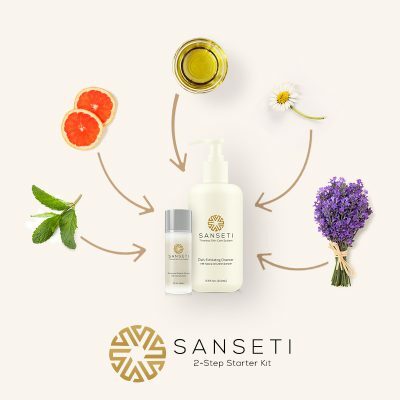 I have other products from Sanseti and they work great. When I saw they have a wrinkle removal kit, I went ahead and bought it. Any beauty product from Sanseti has never disappointed. Now my wrinkles are fading and I feel younger. This was my first time purchasing a wrinkle removal product. I didn’t know what to buy because most of my friends have products that do not work. I got this and it has done miracles on my face. I can feel the difference in the texture of my face. My face was very rough and with the wrinkles on it, it felt even worse. This kit came in and I have witnessed wonders within a few weeks. This product is so light. It does not make my skin feel dry like most of the products I have used before make me fel. It also smells great; not too strong and not too light either. You will just love it. This kit is just what I needed. My skin pores pull the contents in and the skin feels soft. Plus, it has a lot of natural ingredients that not only make the skin look younger but also keep it healthy. I have to say, this kit is just awesome. I had ignored it for months but my face started going back to sagging. Three weeks after I started using it, my face is back into better shape again. For 10 years now, I have had ugly looking acne scars on my face. I have tried almost all hyped up products online but none seems to work as advertised. I have used this kit for two weeks and I see the difference already. I love the product’s packaging and the fact that it smells nice. The formulas for each of the two products on this kit are creamy for easy application. Besides that, I love how fast the kit removes lines on the skin. This 2 step wrinkle defense system has by far some of the best products Sanseti has put out. I use this kit religiously every day, and people say I look younger. I might try their other products next time I order. My wife kept bugging me about doing something about my wrinkles. It did not matter to me, but I obliged. Wow, was I surprised! This system is excellent, and I plan to keep using it. I am so ecstatic about the results I am getting about this wrinkle defense system! I can hardly believe it. I look younger, and I know it has boosted my confidence. Thank you Sanseti! I used to make fun of anti-wrinkle products, and I was skeptical when someone recommended this one to me. But I’m a believer now! It works so well that I’m recommending it to my friends! If you are tired of looking at your wrinkles in the mirror, then take my advice. 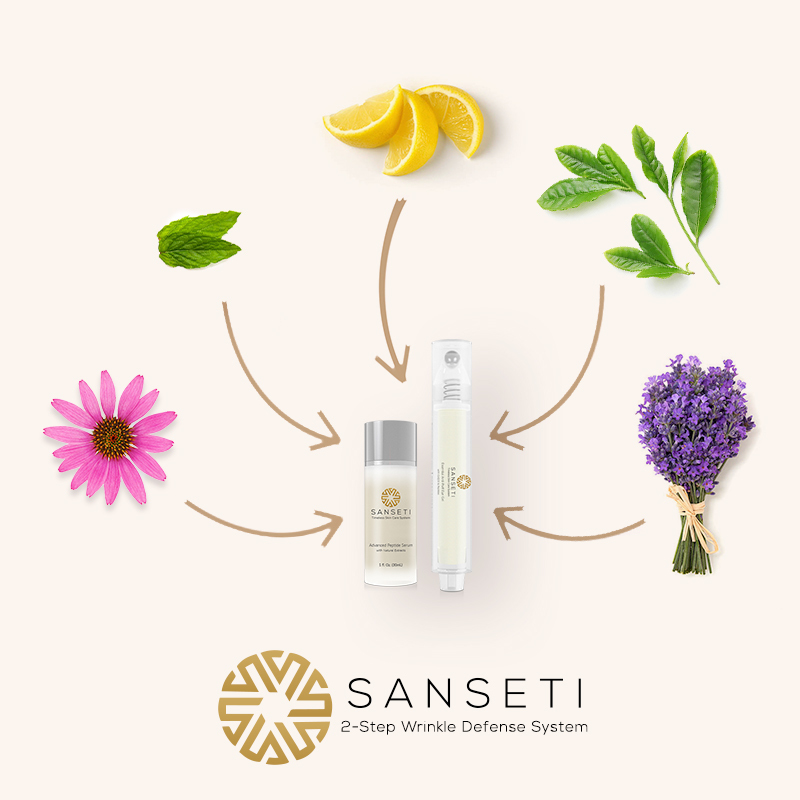 Buy Sanseti’s 2-step Wrinkle Defense System. It is simple to use and most importantly, it really works! Not only did this product get rid of my wrinkles, but it also did so without any allergic reactions. I will keep using it and recommend it to all of my friends. Thank you! It is extremely rare that I endorse a product because I do not impress easily. However, Sanseti’s wrinkle defense product so impressed me that I just had to say something about it. Well done, Sanseti! People do not think men care about their skin, but I do, and the wrinkles around my eyes were no match for this product. They vanished with little effort and haven’t come back. I nearly gave up on the idea of getting rid of my wrinkles until my sister told me about this product. I have to tell you that after using it for a bit, I could hardly recognize myself. My eyes were making me look old so I tried this product. I am not sure what is in this stuff, but it works like magic! I’m so thankful I came across it. It really is phenomenal. If you want to look younger, start with the wrinkles around your eyes. This product is the best weapon for that too. I am still amazed at how well it works. Great product! After trying this product, I was floored at how it took years off of me. One of my friends did not even recognize me at first. She really was shocked at how different I looked. Sure, keeping your face wrinkle-free is an investment, but it is well worth it if you are serious about it. Get this product, because you will not be disappointed. It is awesome. They say a picture is worth a thousand words. I say using this product for wrinkles is worth a million words! I cannot stop talking about it. I look like a new person. I am truly am amazed at this product, and it was not expensive at all. If you want a product that will get you real results, it is worth every penny and more. Wrinkle products can be expensive, and many of them are not worth those high prices, because they do not work. But you will not have that problem with this one! Get it today. I am getting older, and looking younger is getting tougher. Wrinkles are the biggest thing, but they cannot stand up to Sanseti’s products. This one got rid of some of my toughest wrinkles and kept them at bay. I work hard as a single mom, so when I get a chance to treat myself, I take it! 🙂 This time it was Sanseti’s anti-wrinkle system. It is one of the best treats I ever gave myself. Because I have sensitive skin, I have to be careful with skin products. I had nothing to worry about using this one, though. It did no harm to my skin, and it removed my wrinkles! I detest wrinkles, but I also detest the faulty products out there that cost a fortune. That’s why I have been super happy with this product. It was reasonably priced, and best of all, it works! Sanseti has changed my image of wrinkle products forever. I used to spend a ton of money on them, and they never worked. But this one blows them out of the water! I saw my wife using this kit for the wrinkles that were beginning to show on her forehead. It worked on her like a charm. So I got one myself, my buddies can’t stop complementing me. This set is very easy to use and most importantly, it is so gentle on my sensitive skin. It works perfectly with my other beauty products. I looooove it!! Aging lines are gone. Great for big events too! Before I found this product, my skin used to look like that of a 60-year old. My dermatologist recommended products with antioxidants and that is when I found this kit. It is amazing. My skin was beginning to sag perhaps due to my extra weight. One month of using this set and my skin is back to its normal self. Everyone in the office says I look younger than I did last year. This kit has done it for me; the lines that were forming around my eyes are completely gone. I love it. With this kit, I don’t need a closet full of beauty products. I used to apply make-up to conceal aging lines on my face, not anymore. I have the wrinkle defense kit now. Many of the beauty products I have on my dressing table are harsh on my skin, but not this kit. I love that it has all natural ingredients, which are very mild on the skin. I have expensice, trendy beauty products in my house but none of them compare to this kit. This product doesn’t hurt my bank accunt AND it does great work. I can’t stop recommending it to my friends! My hands and my legs have been red ever since high school. When a friend recommended this kit, I decided to try it out. Today, my legs and hands look great. I feel great. It’s only three weeks since I started using this kit and I feel like I’ve used it my whole life. The wrinkles and lines are beginning to fade away and my skin is getting tighter. Who said men can’t have a smooth skin. Being a social media personality, smooth skin and good looks are not optional. My buddy recommended this kit and I love every bit of it. Good work! I am a makeup artist and I love doing impressive work on all my clients. When I discovered this product, I used it on myself and I loved the results. Just a few weeks ago, there were aging lines on my thighs, they looked ugly and made sure I never wore my bikini. Today, I have the smoothest thighs thanks to this kit. Who wants to look old? Not me. For three years, I have been searching for a solution for my wrinkles. My skin felt saggy. Thanks to this kit, my search is over. Most of my friends and colleagues in the office have wrinkles but I don’t. I have never had them and I’m using this kit to keep them away! I never knew I could get an anti-aging kit that actually worked. I am used to commercials that promise EVERYTHING and deliver NOthing. This is an lovely exception, I need it every day. Thanks Sanseti! I have witnessed a great deal of changes on my skin lately. Using this kit has helped my skin relax, no sagging, no wrinkles, no stretch marks and no excess tightness. I feel good. 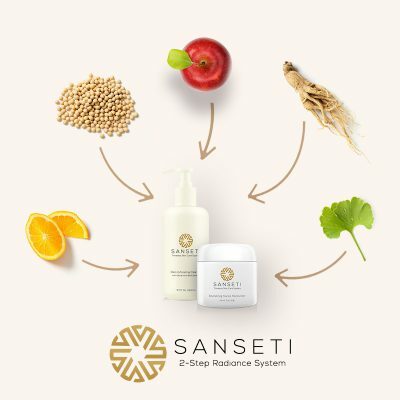 Sanseti is my new favorite skin care brand! The anti wrinkle defense system is sweet! I LOVE the whole look of this kit. Free shipping, quick delivery, and stellar products. What more do you need? My eyes look great after applying the antipuff gel. Easy to apply and noticable after a few days of continued use. I’m really happy with this one for sure. Antiwrinkle creames are my jam. I love them and this is a great one for sure. This is my favorite package from Sanseti so far. Very good ingredients, very good quality. Thumbs up! I’m hoping to get a jump start by defeating wrinkles before they begin. Bring it on! The eye pen is one of my favorite Sanseti products. I like to use it every morning before work (and sometimes add an extra application before going out on the town) 😃 works like a charm! WOW! 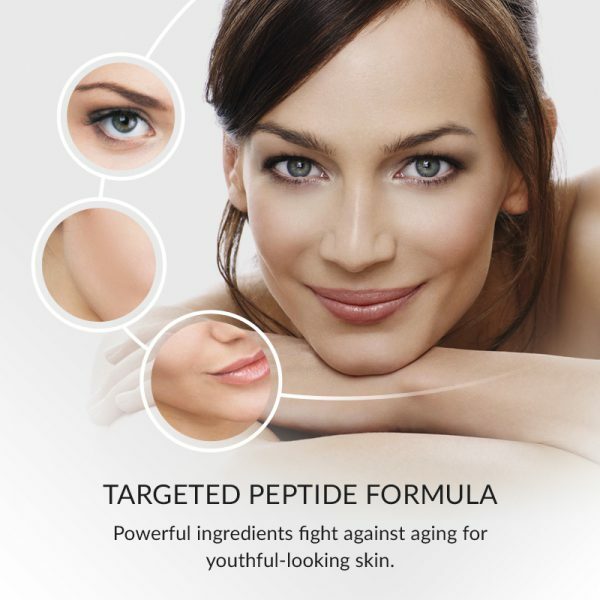 This peptide serum is one of the best I’ve ever tried before. Works great, and a little really goes a long way. Fantastic value – especially when combined with the eye pen. Thanx!